In 1964 the Soviet 37th Tactical Air Army’s command was reorganized. Instead of this, the Northern Group of Forces's Air Force Command was formed. In April of 1968, the air force command was reestablished as the Soviet 4th Tactical Air Force. The Soviet friendly visit in Czechoslovakia at Pardubice airport in July 1968. In 1968 the 4th Tactical Air Force took part in the Soviet Invasion of Czechoslovakia. From the Soviet 4th Tactical Air Army, transferred more tactical combat air units to the Operation "Danube". In the morning August 21st, 1968 fully armed Soviet MiG-21PF/PFM/S Fishbed fighters from Polish bases launched an air blockade of northern Czechoslovak airfields. In 21st August 1968 Soviet new MiG-21S Fishbed-J tactical fighter of 159th Guard Fighter Air Regiment arrived at Milovice-Mladá airfield in 1968 during the Czechoslovak invasion. Soviet MiG-17 Fresco-A fighter-bombers of 42nd Guard regiment at Czechoslovak Hradec Králové airport in 1968 during the Operation "Danube". 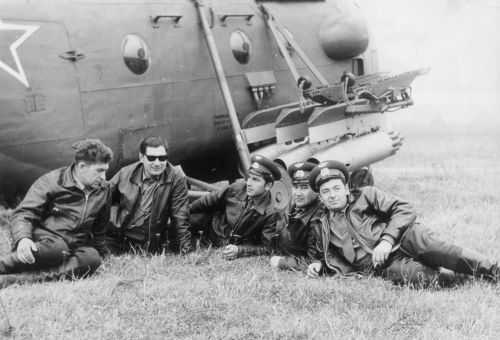 Soviet 245th independent Mixed Air Squadron from Poland Legnica which operated with its Mi-1 Hare courier helicopters with two red invasion bands. 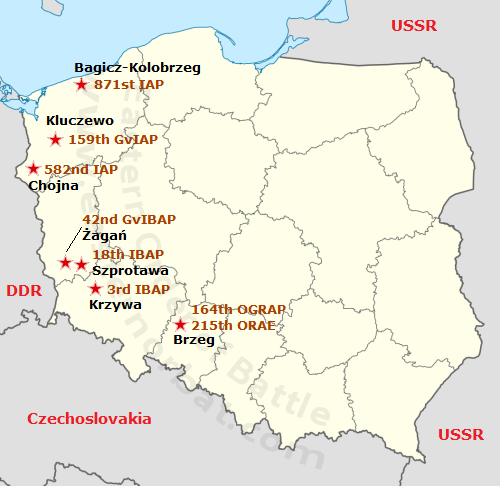 During the first two days, four air unit of the Soviet 4th Air Army relocated to the Czechoslovak airfields. The 149th Fighter Bomber Air Division headquarters and the 42nd Guard Fighter Bomber Air Regiment with forty MiG-17 Fresco-A and two MiG-15UTI Midget close air support aircraft moved to Hradec Králové airfield. 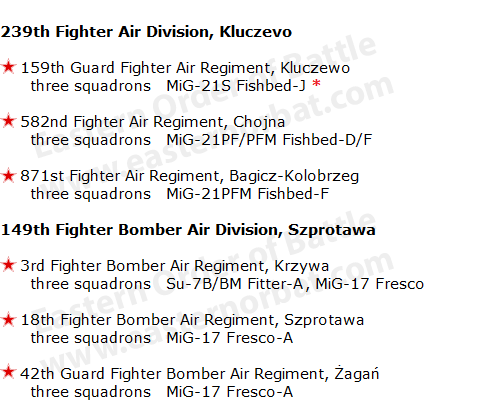 The 4th Air Army command and the 159th Guard Fighter Air Regiment with three squadron MiG-21S Fishbed-J fighters overflown from Kluczewo in Poland to Milovice-Mladá airfield at Czechoslovakia. Only one flight Yak-28R Brewer-D retransferred to Pardubice airfield from 164th regiment in 21st August. The regiment was here one month earlier. Three squadron Mi-4 Hound and Mi-6 Hook helicopters of the 688th independent Helicopter Regiment operated from Prague-Ruzyne international airport. The 3rd regiment with Su-7 Fitter-A from Krzywa and the 215th squadron with MiG-21R Fishbed-H were assigned to the operation. However, it was only operated from Polish bases and probably did not re-locate to Czechoslovakia. The Yak-28R Brewer-D and Yak-27R Mangrove type of the 164th regiment operated from Brzeg airfield in Poland. Interesting: Before the operation, several units of 14th Tactical Air Army moved to Polish airports and later relocated to Czechoslovakia. The Warsaw Pack aircraft wore two red invasion band on the fuselage in front of the tail unit during the Operation "Danube". The 4th Air Army lost one aircraft and one helicopter during the operation “Danube". 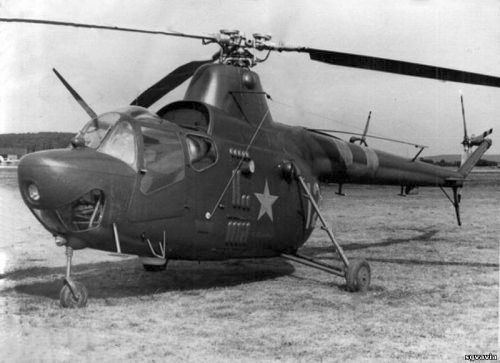 First a Mi-4 Hound of the 688th regiment crashed on August 24th, 1968. The last crash occurred October 30th, 1968. A MiG-17 Fresco was lost and the pilot was killed. The air unit of the 4th Air Army returned to Poland in the fall of 1968. * Czech and new Russian sources state the 159th regiment used MiG-21S version. Old polish source mention MiG-21R version. The 215th squadron replaced their old MiG-15bisR Fagot-B type to new MiG-21R Fishbed-H in 1966. ** Two air squadron of the 164th regiment received the Yak-28R Brewer-D type between 1967 and 1968. Mi-4AV Hound attack helicopter of 688th regiment. This version used six UB-16 rocket pods and four 9M17M Falanga AT-2 Swatter antitank-guided missiles. 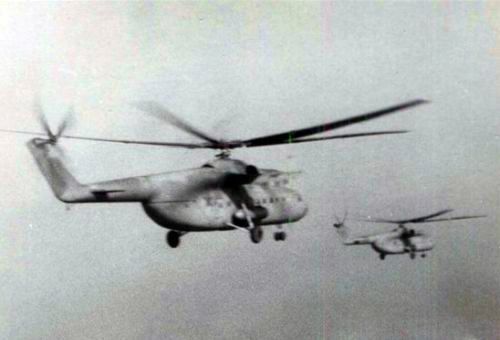 Soviet 688th Independent Helicopter Regiment’s Mi-6 Hook heavy cargo helicopters in the sky. 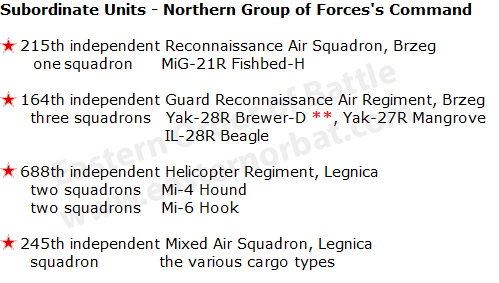 Each squadron used an average of 10 large transport helicopter.